If you have a love for chemistry and physics, but would like to have an engineering degree, Materials Science & Engineering is the perfect degree for you. This is the only discipline in the College of Engineering that gives students the opportunity to study science while getting an engineering degree. 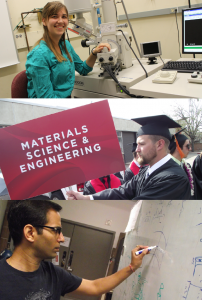 What kind of experience can you expect in the Materials Science & Engineering program here at the University of Utah? You will get a hands on experience. In 2016-17, we had 75 undergraduate students and 13 faculty members -- that's a ratio of six students to every faculty member! Garrett Meeks (BS/MS, '17) stated, "there are many opportunities to get involved in materials science research outside of the classroom. I have been doing research since I was a sophomore, most students here get involved with progressive research as undergraduates." Garrett's experience is common among many of our undergraduate students. Our professors encourage students to get involved and engaged within the lab, which has prepared many of the students for success inside and outside of the program. Approximately 50% of our undergraduates receive offers of employment before graduates, with an average salary of $60,000. Explore everything Salt Lake City has to offer here.